The search for habitable, alien worlds needs to make room for a second "Goldilocks," according to a Yale University researcher. For decades, it has been thought that the key factor in determining whether a planet can support life was its distance from its sun. In our solar system, for instance, Venus is too close to the sun and Mars is too far, but Earth is just right. That distance is what scientists refer to as the "habitable zone," or the "Goldilocks zone." A new study, appearing in the journal Science Advances on Aug. 19, suggests that simply being in the habitable zone isn't sufficient to support life. 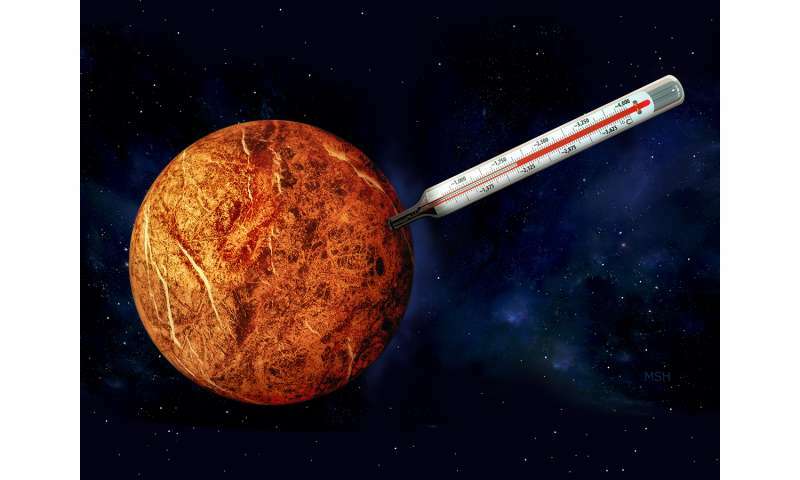 A planet also must start with an internal temperature that is just right. "If you assemble all kinds of scientific data on how Earth has evolved in the past few billion years and try to make sense out of them, you eventually realize that mantle convection is rather indifferent to the internal temperature," said Jun Korenaga, author of the study and professor of geology and geophysics at Yale. Korenaga presents a general theoretical framework that explains the degree of self-regulation expected for mantle convection and suggests that self-regulation is unlikely for Earth-like planets. "The lack of the self-regulating mechanism has enormous implications for planetary habitability," Korenaga said. "Studies on planetary formation suggest that planets like Earth form by multiple giant impacts, and the outcome of this highly random process is known to be very diverse." Such diversity of size and internal temperature would not hamper planetary evolution if there was self-regulating mantle convection, Korenaga said. "What we take for granted on this planet, such as oceans and continents, would not exist if the internal temperature of Earth had not been in a certain range, and this means that the beginning of Earth's history cannot be too hot or too cold." The NASA Astrobiology Institute supported the research. Korenaga is a co-investigator of the NASA "Alternative Earths" team, which is organized around the principle of understanding how the Earth has maintained a persistent biosphere through most of its history, how the biosphere manifests in "biosignatures" on a planetary scale, and how reconstructing this history can inform the search for life within and beyond the solar system. Do they know in the US what is plagiarism? Whether controls it anyone? How authors are protected of plagiarism?? "The Wrong Ideas About Life Creating Zones"
I think they mean that if the planet's internals are too cool, the geo-dynamo and surface tectonics soon stall, and the planet dies young. Also, the lack of volcanic greenhouse gasses mean the 'life zone' won't extend as far out from that sun. Consider Mars. Nawww. Like Laura Dern and Sam Goldman said in 'Jurassic Park': "Life will find a way!" Merkury has a temperature of 100-700 ° K and the average 340. Without rotation and a certain mass which creates a pressure forces (along with tidal forces from the star) that give a molten interior and dynamic geological processes is pointless to discuss the habitable zone. Mars + min. 2x mass Venus = planet full of life. Venus + rotation = there was once a life today very difficult conditions and the mass extinction at the very end. Different systems (faster or slower rotation) = the different values. I can'r evaluate except as an outsider's "looks unlikely". Also, Koronaga just dismiss the geo-neutrino measurements as uncertain, when they support the classical scaling approaching thermodynamic equilibrium. (Since it has worked for billions of years.) That raises flags. So yeah, possibly. But Koronaga has a lot of consensus science to overturn. That is obvious, and the mantle convection/plate tectonic process(es) has long been considered among secondary requirements for long term habitability. jav, Nik: The conservative surface habitable zone is the one to consider as long as the state of mantle convection is a bit of an open question. Within that zone plate tectonics is considered to help biospheres grow productive and old. As Koronaga notes, giant impacts [GI] are now considered normal. The Moon result itself must be rare, c.f. the other terrestrials, but its effect of crust stripping wouldn't be. Models say 3 GI on average (0-8 common span) so we may be a bit low on crust stripping. Same goes for ocean left, we may have more than most, but other's would rarely be without. Interstellar distances avoids a Hart-Tipler paradox, but leaves it as a question, How rare are biospheres? Koronaga's work doesn't look crucial at first blush, but time will tell. Does anyone else think the term "Goldilocks zone" (versus habitable zone) is moronic? Maybe I'm just a grouch, but I cringe every time I see or hear it. While it is unclear just how accurate this paper is, It is becoming more clear over time that we can't just simply assume an Earth-sized planet in an Earth-like orbit will actually be Earth-like. For example, while "giant impacts" may be normal, the degree to which original atmospheres get stripped off may vary greatly. By analogy, one can imagine the Earth would be a lot different if the atmosphere were 10 times thicker or 10 times thinner. Well, simplistic if descriptive, and not a technical term. I can live with it, but I appreciate that there can be other opinions (nice to have them worded), and I never use the term FWIW. @Mark: Agreed. The surface habitable zone concept is a tool, a filter, to guide initial efforts to discover inhabited planets. Then the search need to be expanded, and scientists can start to tear apart the conditions and processes evolved in emergence and long term (detectable) biospheres. Since life can be small scale, on a not very productive planet, we can assume even our bests efforts will be hampered by false negatives. Conversely, life will be more frequent than we can easily assess. This is why life might not exist on the moons of Jupiter and Saturn even though the building blocks of life are all present.